PaRappa the Rapper debuted on the original PlayStation in 1996, more than 20 years ago. The last game to feature the iconic hip-hop hero center stage was PaRappa the Rapper 2 in 2002 on the PS2, though Sony’s renowned rhythm star did make an appearance as a playable fighter in 2012’s PlayStation All-Stars Battle Royale. Needless to say he’s been a staple Sony mascot for many years, even as fewer and fewer gamers can claim to have played the game that launched the beanie adorned dog to PlayStation stardom. Now, a little over 20 years after his introduction to the world, PaRappa is making his presence known on the PlayStation 4 in PaRappa the Rapper Remastered. As expected from recent remasters of classic titles, the graphics have been cleaned up, and some minor tweaks have been made to the game, though don’t expect a complete rebuild in the same vein as Ratchet & Clank. 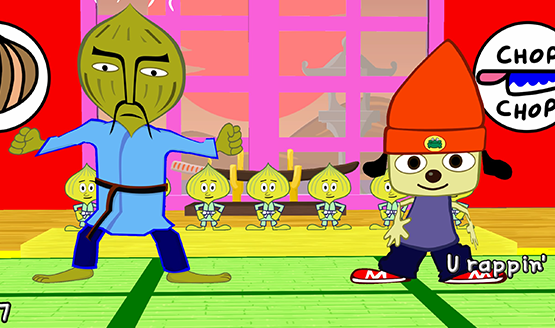 PaRappa’s cartoony graphics look incredible in HD, with the titular character and the rest of the hip-hop masters popping in a stunning vibrancy that hardly betrays the fact that the game is actually two decades old. PaRappa the Rapper is all about the music, and all six of the classic jams still managed to become ear worms after an extensive weekend of running through this remaster. While I’m making dinner, I may find myself spitting “Crack, crack, crack, the eggs into the bowl,” or perhaps yelling “Kick! Punch! It’s all in the mind!” while driving, not to mention “In the rain or in the snow,” that manages to work its way into nearly every other situation. My wife who has never played PaRappa before was enamored with the music and wanted the soundtrack immediately. The uncompressed remastered audio sounds excellent and again, never gave a hint that this was pulled from a PlayStation game of old. In all actuality, this seems to be a remaster of the 2006 PSP port of PaRappa. This version included the ability to download some alternate arrangements for each of the songs, which changes the instrumentation but leaves the lyrics and gameplay identical to the originals. These alternate arrangements are included with the remaster, albeit hidden deep inside the options menu. As some of these arrangements are actually better to me than the originals, I would have liked to see the option to switch to them more prominently displayed when selecting a level, mostly because the game doesn’t even make it obvious that these alternate arrangements are even included at all. PaRappa’s rhythm based gameplay is all about following the hip-hop masters and timing your own raps and rhymes to theirs. The buttons are displayed along the top of the screen and a score indicator tells you if you’re pressing things correctly. For the first couple of songs, I performed well enough but always felt that something was off. By the time I hit level four, I instantly discovered what was amiss. When playing most rhythm games, your button presses are in time to the music and any misses or bad notes cause the soundtrack to begin to distort or play badly. In PaRappa the Rapper, your button presses trigger a sample of PaRappa’s vocal audio instead of impacting a preexisting track, which has a host of latency problems, causing his rhymes to come out about half a beat after what would sound good. For the first few songs, this isn’t a huge issue. While it doesn’t flow as well as I would like, it’s still playable. The issue as I arrived in the fourth song was that a host of rapid syncopated (off-beat) rhymes makes staying on beat with the indicated notes a chore as my ear connects PaRappa’s own vocals with my button presses and I subconsciously try to correct to make the song sound good. Now PaRappa was rhyming in time with the master, but my button presses were too early in order to get the sample audio to play at the right time, causing me to repeatedly fail. I thought it might be latency in my audio setup and switched to direct audio headphones, but it didn’t resolve the issue at all. 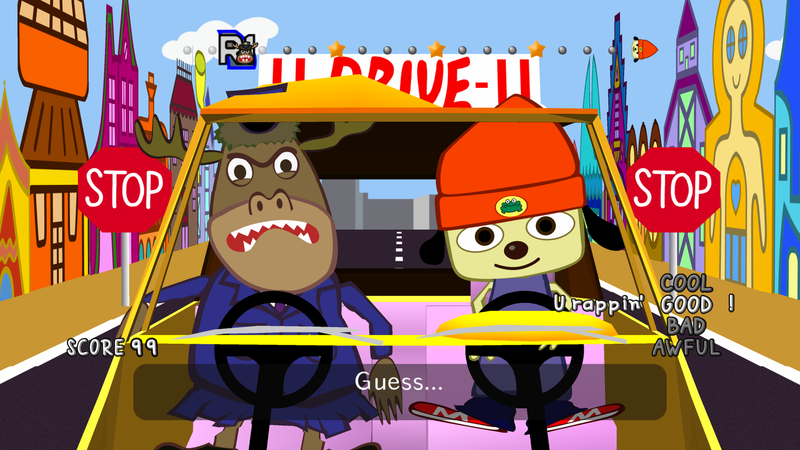 It doesn’t help that the PSP port is often berated as the single most difficult version of PaRappa, with the tightest time constraints on hitting the buttons. What this ultimately results in is that doing well means the song simply doesn’t sound good. Getting a good score means PaRappa is actually rapping off beat, like that drunk guy at the bar who doesn’t follow the karaoke monitor fast enough. 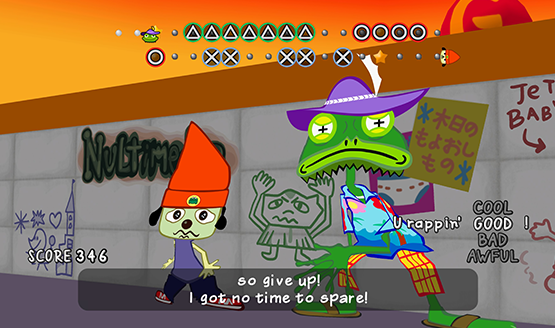 If that’s not enough, PaRappa the Rapper’s “Cool” rating can only be gotten by freestyling (after an initial completion of the game’s six stages with a “Good” rating), which amounts to mashing buttons in time with the music, something that seems decidedly less skilled than actually playing the displayed notes. It never actually tells you how to do this either, and there don’t seem to be any solid ground rules for entering freestyle sections, except that simply playing what’s put in front of you isn’t enough. Imagine if Guitar Hero or Rock Band had just said “Eh, play whatever you want. As long as it’s in time, we’ll count it as okay anyway and award you boatloads of points!” For a sampling of how these freestyle songs sound, check out the video at the top of the page, and know that loads of frustration went in to testing, retesting, and retesting exactly how to arrive at these bonus stages where the master leaves and allows PaRappa do whatever it is he’s doing. I should also mention that finally accomplishing this task on all six songs unlocks the worst song in the game, which isn’t actually a playable track itself. It’s just a glorified music video watching Sunny Funny and Katy Kat dance on a stage while you press buttons to change their outfits. As tends to be the case with many remasters of classic titles, PaRappa the Rapper Remastered doesn’t update the pre-rendered cutscenes that happen between each level, putting the original PlayStation era graphics inside of a frame before loading into the actual remastered stages. It’s apparent that all of the remastering work went into the individual level audio and visuals, with very few adjustments and tweaks to the cumbersome menu setup and how the gameplay actually works, which hasn’t aged well in the two decades since it first saw the light of day. PaRappa the Rapper Remastered is a great throwback aurally and visually, but the frustratingly tight timing required and delay of PaRappa’s audio samples make it a chore to play. It’s a shame that the menu wasn’t reworked to highlight the additional arrangements or to take advantage of how control schemes were updated over time, and I’d rather just listen to the songs than hear PaRappa freestyle his own messy groove over the tracks for the sake of a high score. Still, as frustrating as it can be visiting an old friend that never grew up, there’s something endearing about playing PaRappa the Rapper almost exactly as it played 20 years ago, with a fresh, vibrant coat of paint on its audio and visuals. PaRappa the Rapper Remastered review code provided by publisher. Reviewed on PS4. For more information on scoring, please read our Review Policy.